And many, many more interesting things. There are also so free exercises you can try. If after reading it you still have some questions please send me an e-mail and I will be happy to answer them. 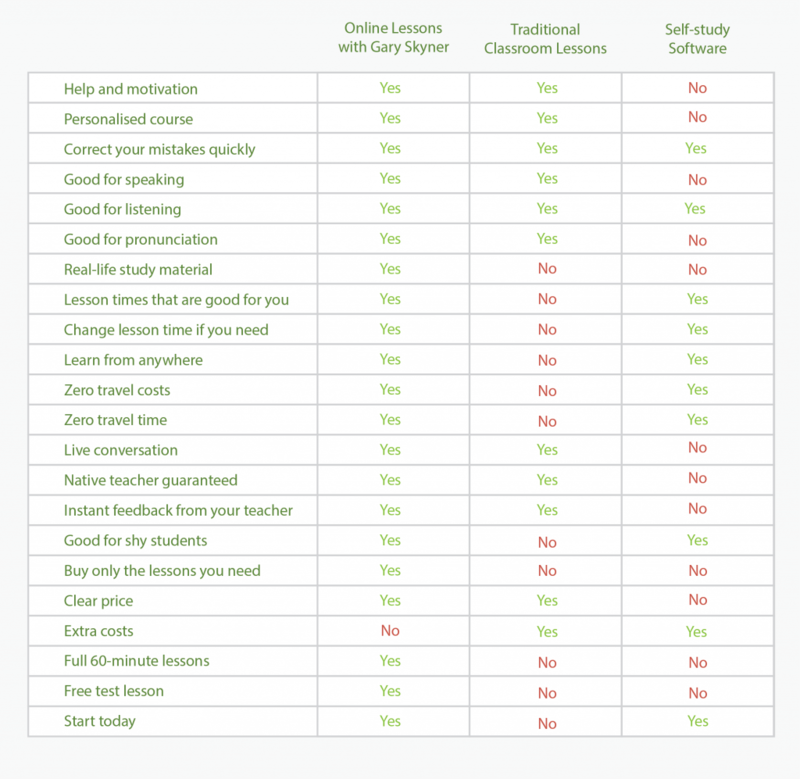 Have a look at this chart to see the biggest differences between online lessons, traditional classroom lessons and self-study software. For me it was an easy decision to start teaching online. But, I can understand that for some people the decision to learn online could be difficult. So, here I have tried to imagine some of the questions that you might still have. 20 EUROS for 60 minutes. Lessons are bought in 10s in advance. No discounts, no negotiating. I’m good. In our lessons there will be lots and lots of speaking by you. We will use real-life videos, photos, texts and audio files. We will study general English. And no coursebooks because they are boring. Yes you can. Its free and takes about 20 minutes. I have tried to imagine every possible question, but if your imagination is bigger than mine and you still have a question then use the contact form below to ask me . . . If you want to start online English lessons today you can ask me for a free test lesson.